I just got back from my Turks and Caicos trip. Check out this video clip. I used my phone to capture the view from the private dock at Emerald Shores Estate. There was no wind that day and the water is clear. This place is fantastic! I can’t wait to go back. Spent many vacations here. Restful, Relaxing, everything needed for privacy with the benefit of a full kitchen and right on the water. Off the beaten path yet close to all else on the island. Mullarkey Realty, LLC, is based in Queens, New York, USA. EI# 75-3059897. Mr. Mullarkey has been operating real estate properties since 1972. 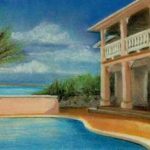 Emerald Shores Estate and Whitby Beach Villa, in the Turks and Caicos Islands, are some of the properties run by Mr. Mullarkey. Emerald Shores Estate (Business Licensing Ordinance #9426) was issued by the Turks and Caicos Government in February 2005.